Funeral services are pending for a long time former Bell Gardens administrator who passed away unexpectedly Jan. 13, less than one month after retiring from the city. Former Assistant City Manager John Oropeza, who retired at the end of December, died suddenly after a brief illness, the city announced Tuesday. He was 59. Oropeza, who’s “diverse” career with the city spanned 38-years, was recognized in December by the city council for his nearly four decades of service by the southeast city. At the time, Oropeza told EGP that he was happy with his decision to retire, but admitted he will miss serving the city he said “made him the man he is today. “I’ve given everything to Bell Gardens and in return the community has recognized my hard work.” Oropeza said. 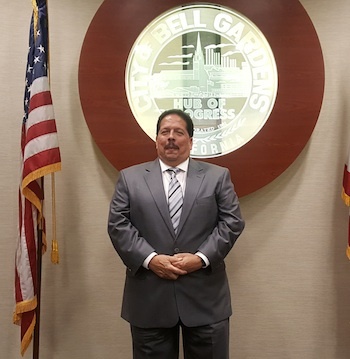 “We are shocked and deeply saddened by the untimely death of our friend and colleague, John Oropeza,” said Bell Gardens City Manager Philip Wagner. “On behalf of the City Council and every employee of the City of Bell Gardens, our deepest condolences and prayers go out to the Oropeza family. Oropeza started working at the City as a temporary employee in 1979, quickly becoming a permanent employee, working his way from maintenance to lead worker in Public Works, moving up to Acting Director and becoming Director of Public Works in 2000. He was appointed Interim Director of Community Development in 2011 and became the Assistant City Manager in January 2012, a position he held until his retirement in December.